During the holidays, the situation is particularly bad, according to Otto Tritten of the Gstaad operations centre. After parties, some people just throw their rubbish everywhere. When you see the things that Otto Tritten and his team find at the rubbish collection points after the holidays, you realise that some people have a real nerve. The manager of the Gstaad works explained: “We find rusty grills, old suitcases, expensive olive oil cans, gift wrap, detergent bottles – there’s no end to the rubbish that people dump.” Tritten also notes that some people just dump their rubbish wherever it suits them. The collection points are clearly marked and every household receives an information leaflet from the municipality. What can be done about the problem? Tritten says he doesn’t want to start imposing fines because that would be rather drastic. That’s why he’s appealing to guests and the general public to voluntarily abide by the rules. He knows from experience: “Many visitors appreciate the fact that everything’s so clean here. We really need to uphold our reputation.” If you come across someone who isn’t disposing of their rubbish correctly, Tritten recommends approaching the person in a friendly manner and referring to the leaflet. To improve: It would help to have one main point for Gstaad and not to have to go by car or by taxi to Saanen for small cardboards and minor kitchen items, to the school for papers and to other points for the rest. The bins at the cinéma parking do not stand open making it difficult to hold while lifting the heavy bags. 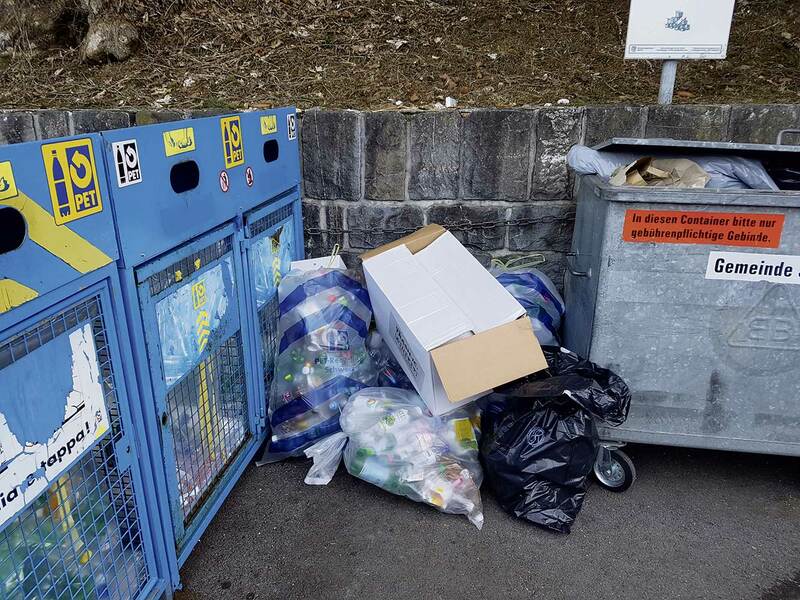 Twice a week garbage removal is not enough for high season in Gstaad given the increase of residents. That is really sad. I've had a holiday home in Saanen for 13 years and every time I'm there I stress about making sure I'm recycling and putting them in the correct bin. I notice garbage left just outside of the bins. I love how clean it is in the village and it's a shame that some people can't keep it that way or don't care.